This outfit reminds me of my first love, Dancing! I remember wearing a hideous DIY polka dot pants for our high school dance contest. The dots were made of cartolina papers attached to my jeans. KILL ME NOW! HAHAHA! Thinking it was the lamest 80's music to dance with the funniest outfit in town. I just don't know what gotten into my mind during that time. This is such a not-in-the-mood post ever. What a bad day, feels so disrespected in so many ways. Some people just need to grow up. But then again, "Life's a Dance, You'll learn as you go. Sometimes you lead and sometimes you follow. Don't worry about what you don't know, Life's a dance, You'll learn as you go! " I love your outfit, great necklace! Thankd for your comment. I am following you already (bottom of GFC page 2 - Ancia). Really cool skirt and perfect outfit. You look fantastic. sorry you have had such a rubbish day- i have them too, where i just wish i was the only person in the whole world. I am SOOO glad you stopped by my blog! You are absolutely stunning and your style is flawless! SO excited to be your newest follower darling! i'm in love with that skirt so much !! and very lovely fashion blog as well ! hope you'll like mine too ..
Lovely outfit! I esp. love your skirt and how it gives contrast to your ensemble. P.S. Thank you so much for your prompt response, please tell your biker husband about our blog. Glad to follow you back thru GFC#213 and Bloglovin#17. Sure I follow you dear! Great blog! Cool photos love <3 And love your blog layout so cute ans sweet <3 Mind to follow thru GFC? Pretty pretty. Love your outfit. Follow you back dear! I love the entire outfit!!! I LOVE your skirt ! Awesome look ! Nice blog, i like the custom artwork and the font, really nice. Also nice photos. Cheers from Milan. Love your outfit, in special the blouse, so nice! Your blog is very interesting, wanna follow each other? Your outfit is so cute the top especially polka dots are so adorable and the chanel bag it's perfection. Love your style. I'm your new follower for sure! Hi, thank you for visit at my blog and leaving such a lovely comment! It would be nice to follow each other! I'm following you right now! Have a great time! Best wishes from Russia! the details of the collar i so classy!! Such a lovely look,adorable skirt. Thank you so much for your comment on my blog. I love your Chanel bag by the way, my favorite brand! 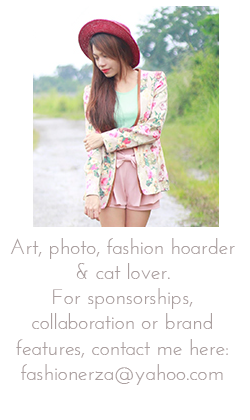 Thanks for following too<3 Def stopping by your blog again! lovely outfit! i love this skirt you are wearing, so perfect. Your look is amazing and I love your blog!! I follow you now with google friend connect and bloglovin too!! Hope you'll do the same! I wait for you in my blog!! Kisses! I love that Chanel bag, a classic, timeless piece that goes out with everything. Love your style! Hi!! your blog is so interesting ! Thanks for follow me :)! I'm following you too :)!! LOVE THIS!!! You are totally cute!! Im following you on Facebook!! Let me know if you are on BlogLOVIN!!! Feel free to visit my blog, would love to see you there? Wow You are so beautiful and i like your red custom.Great post.